Smooth head design for gentle fabrics. Easy to see through head to let you know when your job is complete. Forged brass control valve, rated at over 1200 PSI, with exclusive 'soft-opening' feature. 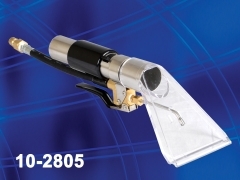 Vinyl covered handle for stress-free handling. High pressure flex line with quick connect included. Easy access single nozzle, precise pattern.